A collection of charming and celebrated writings about cats, from Doris Lessing, winner of the Nobel Prize for Literature. 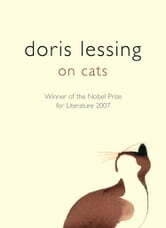 Doris Lessing’s love affair with cats began at a young age, when she became intrigued with the semi-feral creatures on the African farm where she grew up. Her fascination remained undiminished by the handsome domesticated creatures who shared her flats and her life in London and grew into real love with El Magnifico, the awkwardly lovable cat who in his later years suffered the great indignity of becoming a three-legged beast. Consisting of Lessing’s celebrated collection of stories, ‘Particularly Cats and Rufus’, and the poignant though unsentimental memoir, ‘The Old Age of El Magnifico’, this book is a brilliant evocation of the feline world.